Stand on scale measures weight as well as other body composition metrics. 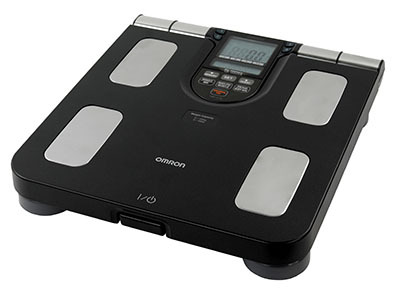 The Omron HBF-516B Body Composition Monitor and Scale is a digital scale that provides full body sensing. It gives a full and comprehensive understanding of the user’s body composition to help the user reach their fitness goals. This simple and accurate body composition monitor features an easy-to-read large LCD monitor and auto on/off function. Full body sensing is more accurate than measuring with feet alone. The Body Composition Monitor and Scale measures 7 fitness indicators including body fat percentage, body mass index (BMI), skeletal muscle, resting metabolism, visceral fat, body age and body weight. This Omron body composition monitor can be used by adults up to 330 pounds and 6.5 feet tall. It stores up to 180 days of data to track progression over nearly 6 months and features a four-person memory profile for the whole family to use. Dimensions: 12.5" x 2.5" x 12"